As an alternative to our extremely popular Cantilever Gates, we also offer Swing Gates to provide a high degree of security to all commercial premises. 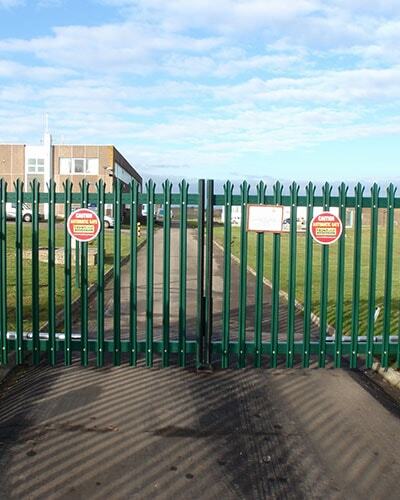 Swing Gates can be provided as either manual or fully automated. We fully design and manufacture all Steel Swing Gates in-house, meaning we can produce both traditional and contemporary designs. High quality products and services. Call us for a free site quotation. Swing gates are extremely popular with our residential customers, and in the case of automated swing gates, these can be powered either by gate back operators, fitted to the rear of the gate leaf, or underground drives located within the foundation area of the gate, with just a steel cover plate on display. Once the automation has been activated and the gates have opened, they will remain open for a preset time (usually variable between 0-120 seconds) before closing automatically, providing that all safety devices have been cleared. The automation can also be set to remain open until another command is given by the user, instructing the gates to close. Both gate back and underground operators have a special release key, enabling manual operation in the event of power failure. As with all of our Automated Gates, there are a number of safety considerations which have to be included in the system. There are also a number of options available to you with regards to the ease of use/access, such as roadway detection loops, transmitters, keypads and intercoms to name just a few.